Kabbalah means "receiving." We receive the ancient secrets of how to create and sustain a meaningful, fulfilling, and successful life. It is about creating Heaven on Earth. The Kabbalah is a study of the Tree of Life. The Tree of Life is comprised of ten spheres. Each sphere represents an ascending level of consciousness. Each sphere is also a different quality of the Creator. Throughout the Kabbalah course, we travel up the Tree of Life, one sphere at a time each month, in an ascensional progression. 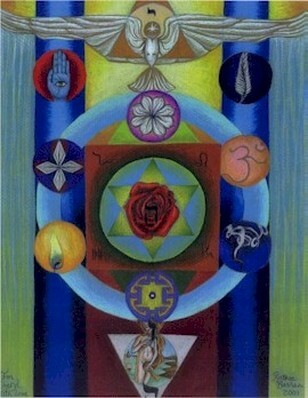 We embody the ten different aspects of our Creator on the Tree of Life. We therefore learn how to create like our Creator. We learn to live in the Unity consciousness with joy and love, rather than in the competitive Duality consciousness with pain, despair, fear and chaos of duality. We become the proactive co-creators with G-D of the lives we desire. The Kabbalah is an amazing experience! The Archangel Metatron, who presides over the highest sphere, Keter, the Crown, in the Tree of Life, brought this Tree of Life glyph to King Solomon about 3,300 years ago. Archangel Metatron recommends journeying through the Tree of Life four separate times, to work through our physical, emotional, mental, and spiritual resistance. Journey Experientially through the Tree of Life with Clair-Ascension® Kabbalah Courses! For certification and licensing to perform this "Clair-Ascension® Kabbalistic Balance D.O.V.E." work with clients. For certification and licensing to teach "Clair-Ascension® Kabbalah" to students.